Mother’s Day is a time to honor mothers of every kind, and to celebrate the innovations and methods of support available to Native American mothers residing in tribal communities. Cherished in the lives of not only their children but also their community at large, the values that mothers instill in their families spread across their own tribe and beyond. It makes sense then, that Native communities would offer programming to support new mothers, often the most vulnerable time in a new parent’s life. Prenatal and post-natal wellness checks, parenting classes, and immunization checks are some of the ways tribal programs assist new mothers in Native communities. Native American mothers often face more high-risk pregnancies and maternal complications than their non-Native counterparts do, and the infant mortality rate is 4.4 percent less for Native Americans than for other ethnicities in the U.S. The birthing risks are due in part to inadequate nutrition, diabetes and other health issues preconception. Native women have a harder time accessing preventative healthcare on the reservations, and the barriers may include something as simple as transportation to doctor appointments or consistency of primary care. 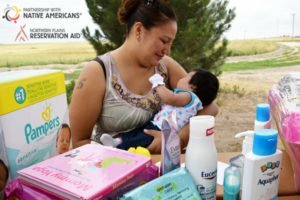 Indian Health Services, the federal health program for American Indians, also works to improve outcomes for Native American mothers by compiling information on what to expect during pregnancy, how to protect the health of the baby, and resources for new mothers in their local communities. Unfortunately, these Indian health hospitals with full obstetrical services are rare on the reservations PWNA serves, focusing more on critical illness than preventative care. 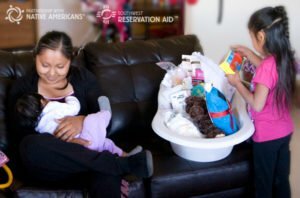 Partnership With Native Americans supports tribal health and wellness programs with our Baby Baskets and Cradle Club services, available through our Northern Plains Reservation Aid (NPRA) and Southwest Reservation Aid (SWRA) programs. Baby baskets are a new parent “starter kit” replete with essentials for newborn care, along with personal care items for mom, and given to all new moms at participating partner hospitals before they are discharged. The Baby Basket and Cradle Club services also help tribal health programs ensure a healthy start for infants, by providing additional supplies, diapers and even strollers that moms can earn once the baby’s immunizations are completed. Roslyn is 32 years old with four children, and Julia Grace (two months old) is her first daughter! The family is living in a one-bedroom apartment in an elderly complex located on the Pine Ridge Reservation. Housing is scarce and Roslyn is on a tribal wait list, but in the meantime, she makes the best of cramped quarters and has other long-term goals. ”I want a bigger home – it will all work out, and I don’t want to give up my dreams of college,” she said, grateful for all the content in the baby basket she received before leaving the hospital. Baskets of essential items, like the one Roslyn received, can help new moms enjoy their newborn and ease the adjustment once they return home. The baskets include items such as blankets, bottles, diapers, skin creams, and bath supplies, which can cost families quite a bit and are not always available in the remote communities on the reservations. Services like these also impart a sense of care and comfort for new moms. Sustaining families and traditions are among the greatest things Native American mothers can do, and on this Mother’s Day it’s important to take a moment to appreciate the mothers in your life, and educate yourself on all the ways you can support them as they support future generations! This entry was posted in Humanitarian, Programs and tagged baby baskets, Indian Health Services, Mother's Day, Native American mothers, prenatal care. Bookmark the permalink. Trackbacks are closed, but you can post a comment. Awesome issues here. I’m very happy to look at your article. I don’t believe I’ve read something like that before… Really.. thanks for starting this up. You appear to grasp a lot about this,… this is wonderful blog. A fantastic read. Thanks for finally talking about new mothers and maternal health in Native American communities. Liked it! it is uncommon to look at a nice blog site like this one these days. and reading very informative articles. What’s Happening…I stumbled upon this and have found it absolutely useful… Great job. Well I definitely enjoyed reading it.